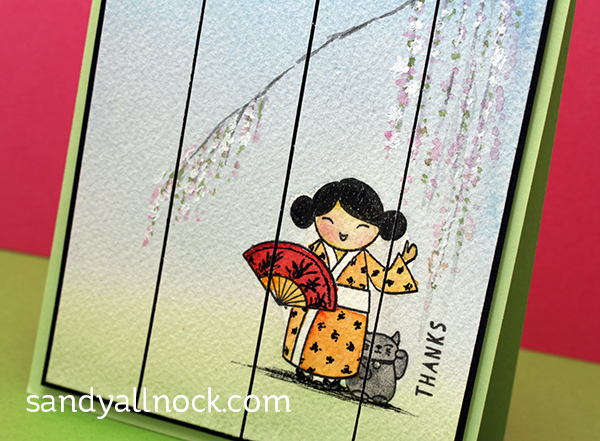 It’s new release day for Ellen Hutson – all kinds of fun Japanese-themed stamps! Julie took a trip and brought back all her inspiration to make us some fun stamps. I’m using “So Matcha” for today’s card, and doing one of my crazy but not so hard backgrounds with it…I was inspired by Googling for “Japanese Art” to find something that would work with this sweet little girl and her fan and kitty! Watch the video below or click HERE to see it in HD on YouTube. Isn’t she the cutest little stamp? I love that her kitty is waving. LOL! Absolutely adorable card! I love all things Japanese and this is fabulous! Your card is beautiful. The background is gorgeous. Thank you for the video tutorial. I learn so much from your videos because you explain the reasons behind each choice you make. Wow! This is so pretty! Love those gorgeous cherry blossoms and your sweet little gal. Beautiful art work! You really brought that stamp set to life. It’s perfect! I love how you painted the cherry blossoms in the background. I think that made the card and those images just pop (like you intended). I always learn from you, thank you! A stunning card Sandy, your background is so awesome. I love also the way you painted your little Japanese girl and gave a little “Sandy twist”. Cutting the panel in sections and put it back with a little gap makes it a real Japanese art work! Thanks. Just lovely. Thought it was perfect before the panels. After – Wow! That is so pretty, Sandy! The stamps are adorable, and your watercoloring is perfect. Sweet card!! Love the happy cat . I just might have to get this set. Great beautiful card. 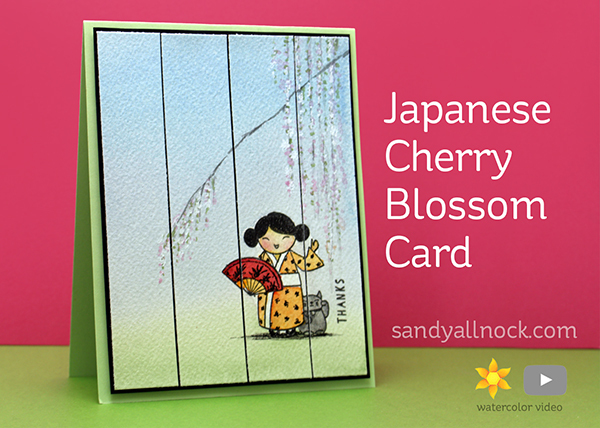 Love the cherry blossoms and the easy way to create them. Love the card layout on the black back.